Dr. Hessburg’s wildfire presentation has some good points that are worth reiterating, however, he also misrepresents some finer points of fire ecology. Basically, he promotes the notion that fuels are what drives large wildfires which he pejoratively calls “mega-fires”. The pejorative language is found throughout his presentation with terms like “destructive wildfires” “unhealthy” forests, and so forth—all of which are questionable from both an ecological perspective, as well as countered by other scientists. The main problem with Hessburg’s presentation is that he promotes the idea in many direct, as well as subtle ways that fuels are the reason we are experiencing large wildfires, while climate/weather is the main driver of large wildfires. The idea that “fire suppression” has led to fuel buildup which is driving large wildfires is inaccurate for most plant communities around the West. Thus, solutions like thinning/logging are less effective or harmful to healthy forest ecosystems. The second problem is that Dr. Hessburg characterizes years when significant fires burn large forest area as “destructive”. While I am sure that he knows better, the way he presents his program, one is left with the impression that the Low Severity/High-Frequency Fire regimes that may have characterized some dry ponderosa pine forests apply to most of forest types that are burning, which it does not. While he notes that some forest types naturally burned in stand replacement/ high severity fires, He seems to imply that the only “good” fires are those that burn at low severity. He likes green forests—which is a philosophical perspective, but not an ecological perspective. From an ecological perspective, years with significant acreage burned are not “disasters”, rather such “fire years” rejuvenate many acres of the landscape. The perspective that fire “damages” the land reflects the Industrial Forestry perspective that sees dead trees as a “waste” of resource or “destroying” the land. Nothing could be further from the truth. We will address this later, but suffice to say, the majority of all acreage has been and always has been the result of larger fires burning under extreme fire conditions. Under such conditions, mixed to high severity burn mosaics are the norm, not an aberration or a failure to “manage” the forests. Although Hessburg gives some acknowledgment to the importance of high severity fires (for instance in the creation of snags for woodpeckers) the general theme is that we want “green” forests, not burnt forests. This is contrary to evolutionary history and ecological history. There are as many, if not more species of plants and animals that depend on dead trees created by wildfire, bark beetles, and so forth than relying on green trees. We need wildfire, bark beetles and so forth for “healthy” forest ecosystems. The positive aspects of Dr. Hessburg’s presentation are his emphasis on the need for more unmanaged wildfire. Also, he correctly points out that much of the problem we have with wildfires is due to the continuous buildup of homes in the Wildlands Urban Interface (WUI). There are other aspects of his talk that I fully agree with, but for the sake of brevity, I will focus on the points of disagreement. Throughout his program, Hessburg suggests that “fuels” are the problem creating large wildfires (which ecologically we need). If fuels were the major driver of large fires, we should expect the forests along the coasts of Oregon and Washington to have the greatest wildfires—they have more “fuel” per acre than 100 acres of forest in most parts of the Rockies or east of the Cascades. Why don’t they burn? Because the weather/climate is too moist for successful fire spread. Keep in mind throughout the presentation how fuels are emphasized, while only at the end of his talk does he give some acknowledgement that a warming climate might be responsible for our wildfires. Hessburg starts his presentation with a video about the Sleepy Hollow Fire near Wenatchee, Washington. The fire led to the loss of a number of homes. While the bulk of his presentation is about “fuels” in our forest, what is not immediately apparent from the film clip is that the Sleepy Hollow Fire burned largely in grasslands, not forests. It is questionable whether “fire suppression” had anything to do with the fuels that sustained the fire. (The majority of all wildfires are in non-forested landscapes where fire suppression—even if it was a major factor in wildfires—is not responsible for blazes). Like all such fires, the Sleepy Hollow was driven by high temps, low humidity, drought and in particular high winds. Burning embers were reported to be thrown as much as a mile ahead of the fire front. It is exactly these kinds of conditions that make fires nearly impossible to stop. And again, pointing to the importance of climate/weather in blazes, rain, not firefighters, put out the fire. It is important to point out that reducing the flammability of homes is a home owner’s responsibility. Also, note that many of the burnt-out foundations had green trees surrounding them. This suggests that the fire never reached the home, but burning embers were able to ignite the houses due to the failure of home owners to take proper steps to protect their structures. Next, he shows a map of western wildfires. The map is striking because it shows a lot of the western US has burned. But what isn’t obvious from the map is that majority of that acreage burned at low severity or did not burn at all. Research has demonstrated that even in so-called “high severity” fires, the majority of acreage charred is at low severity where the majority of trees survive the blaze. Why is this important? Because the map exaggerates the idea of “mega-fires” as destructive and affecting much of the western US. Most so-called Mega Fires actually have more acreage burning at low severity than high severity. In other words, if you had a 100,000 acre fire, perhaps 20,000 acres would be charred at high severity and another 30,000 at mixed severity while the bulk or 50,000 acres would be in the low severity category. So again, the characterization of “mega fires” burning 100,000 acres creates an image in people’s minds of 100,000 acres of nothing but snags. However, that is never the case. Hessburg then correctly notes that 57% of the FS budget now goes towards fire suppression and firefighting at a cost to taxpayers of $2.1 billion. Hessburg goes on to say the real costs are much higher, including rebuilding homes, business losses, and so forth so he estimates the real costs are $50 billion. He does this, I think, to make the case that if we did more to prevent wildfires (i.e. logging/prescribed burning) we could avoid such costs. He attributes the “more destructive fires” to “increased fuels” and more severe fire weather. It’s good to see him acknowledge the role of weather in large fires, but whether fires are “destructive” from an ecological perspective is questionable. There are interviews with people who lost homes in the Sleepy Hollow blaze. This is done to garner emotional connection with the people whose property was burned—but he does not acknowledge that the Sleepy Hollow blaze burned a new subdivision in the WUI that would not have occurred except t hat people ignore the danger from fires and are irresponsibility building in vulnerable places. He asks the audience to close their eyes and imagine a forest-I believe the intended consequence is for people to picture a green forest. Hessburg does a good job of outlining the natural role of fire and how many species are adapted to wildfire. Unfortunately, this is not the emphasis of his talk. This is followed by a graph lying out three major fire regimes—low severity, mixed severity and high severity. The high severity fire type is labeled as “destructive” even though it is perfectly normal for those forest types. Hessburg goes through some history of things that influenced wildfire from Indian burning to livestock grazing, logging of large old growth trees, the birth of the FS and the 1910 Burn and fire suppression. At this junction, it’s important to note that while the thrust of this talk focuses on the low severity/high frequency fire with burns every 10-20 years that characterizes SOME (but not all) ponderosa pine forests, we are led to believe it applies to all forest types in general. It is important to note that the clear majority of forest types in the West have much longer fire rotations, and thus, have not been impacted by fire suppression at all. There is no unnatural “fuel build up” in forests of lodgepole pine, spruce, fir, and other moister forest types which tend to have fire rotations of hundreds of years. Also, most of all forest acreage burned annually in large fires are the highest elevation forests of lodgepole pine, spruce, fir, and other forests that have long fire rotations. Thus, fire suppression is not contributing to the large acreages burned because they only burn when climate/weather conditions permit large fires—which is relatively infrequent. The emphasis on low severity/high-frequency fire regimes where some fuels buildup may have occurred ignores how limited dry montane forests of ponderosa pine are on the landscape. For instance, in the Northern Rockies region which includes northern Idaho and Montana, dry montane forests of ponderosa pine, and occasional dry Douglas fir occupies only 4% of the land acre and much of this is on private lands. To characterize “fire suppression” as responsible for major wildfires is an exaggeration. Next Hessburg shows us a chart showing how at the early decades of the 1900s we had a lot of acreage burned. Then we go through a period where there is much less fire on the landscape which he attributes to successful “fire suppression.” Then in the 1980s we see a big uptick in wildfire acreage burned, which Hessburg attributes to fuels that built up during the era of successful fire suppression of the prior decades. What he doesn’t show is the climate during this period. During the early part of the 1900s, it was much drier and warmer. We experienced many large wildfires like the 1910 Burn that covered more than 3.5 million acres. But in the period between the late 1930s and early 1980s, the time when Hessburg suggests that fire suppression was successful, the overall climate was cooler and moister due to the Pacific Decadal Oscillation (PDO)- a natural variation in ocean currents that influences climate. Cool, moist weather in the late 1930s-1980s would have limited fire ignitions and spread. This is the same period that we attribute fuel build up to “effective” fire suppression. But it’s just possible that the conditions were not favorable for fire spread, thus the influence of fire suppression may be exaggerated and overrated. The current buildup of fuels and dense forest stands may be a “natural” outcome of climatic conditions. With warmer temperatures and drought, it is natural for vegetation to burn as an adjustment to the new conditions. Thus, it can be argued that the dense forest stands we see as well as the current spate of wildfires is more a consequence of climatic conditions, rather than “unnatural” or “unhealthy” conditions. What do you get when it’s cooler and moister? For one fewer ignitions. And any ignitions you do get go out quickly and do not spread. This accounts for the significant decline in wildfires for the decades between the late 1930s and 1980s. 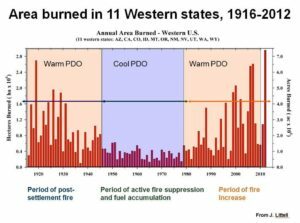 After 1988 (when Yellowstone burned) we see a retreat in the PDO and warmer, hotter weather return with some of the most significant droughts in centuries. For instance, the recent drought in California was characterized as the driest period in the last 1000 years. Why would anyone not think that given the worse drought in a thousand years that wildfires would be more common and larger? The climate and weather have a greater influence on wildfire than fuels. Another consequence of the mid-century cool, moist conditions is that it favors the survival of tree seedlings, so the denser forests we see in many areas is again a natural consequence of climate/weather, not fire suppression. This has led to the “epidemic” of trees that Hessburg inaccurately attributes to fire suppression. Hessburg, like many, repeats the notion that 100 years of fire suppression has led to fuel buildup. This has a credibility problem. It’s disingenuous. Even today with the most modern firefighting equipment we cannot control large fires when the climate/weather is hot, dry, and windy. To suggest that back in the early 1900s a small force of men riding mules in virtual wilderness across the West, armed with shovels and picks, had any significant influence on fires is absurd. In fact, during the 1920s and 1930s, as much as 40-50 million acres burned annually. Today if 10 million acres burn, it is called a “record” year for fire. So it’s difficult to argue that fire suppression was “successful” for 100 years. If you look at the fire chart above, you see that during the early part of the century when it was hot and dry, there was significant acreage burned despite “fire suppression” and again once the cool, most midcentury period was over, and the climate turns hot, dry and droughty we again have significant acreage burned. The cool weather had much more to do with fewer large fires than any fire suppression. Also, keep in mind that most moist middle to higher elevation forests do not burn frequently whether the fires are “suppressed” or not. Indeed, most will go out without any suppression if conditions for a burn are not “ripe” for a large fire. Hessburg concludes that all these factors have resulted in “unhealthy” forests, with the “wrong species” and an “epidemic” of trees. For instance, the growth of grand fir is seen as the “wrong” species. But grand fir likes moister and shadier conditions. It’s perfectly “natural” for succession to move towards grand fir when conditions are moister. It’s not the “wrong” species. It’s the right species for the current conditions. He concludes that natural processes like bark beetles, drought, disease, and wildfires are indications of “unhealthy” forests. When indeed, these factors both reduce the density and “epidemic” of trees he decries. He shows some comparison photos which date from the 1930s and compares them to more recent images of the same locations which show to one degree or another an increase in forest density. Like all photos, one can be selective in which you choose to use. Not that I don’t believe that forest density has likely increased-due to the moister, cooler midcentury climate—there are other problems as well. The 1930s photos were taken after decades of hot, dry weather that contributed to large wildfires at the turn of the century. So the starting point is not necessarily “unbiased”. We see a video of Hessburg in an open park-like ponderosa pine stand which he attributes to frequent low-intensity blazes that kept it open. We then follow him into a much denser forest of Douglas fir which he suggests is now so dense due to fire suppression. But he has changed the slope aspect and thus the micro-climate. He is in a moister, cooler area where Doug fir can grow and is natural component of the forest ecosystem. There is old growth Doug fir in the photo demonstrating that the site is capable of sustaining Doug fir. This is natural succession, not an “unnatural” forest stand. Hessburg does a good job of explaining how home expansion into the Wildlands Urban Interface is one of the major contributors to growing cost of firefighting. He notes that 60% of all new homes are being built in the Interface. This is a worrisome trend. Hessburg correctly suggests that climate change will exacerbate wildfire spread and severity. The fire season is longer. But these events are symptoms of climate. All vegetation community respond to climate. IF the climate is hotter and drier, the forest WILL change. You can’t hold back succession. It’s foolish to try. IF you don’t like these projected changes, the way to change them is to reduce human carbon releases into the atmosphere. He uses video footage of the recent large fire that charred Fort McMurray Alberta. Of course, it’s important to note that this huge fire was not the result of “fire suppression” since suppression has had limited impact on the boreal forests of Canada because of remoteness. Rather this fire is a completely normal event in the boreal forest under hot, dry climate/weather conditions. Peterson is the climate-fire expert. He makes the point that fire season is now 40-50 days longer (i.e. climate/weather) is affecting wildfire size and severity (not fuels). Mentions that 95-98% of all wildfires are put out and 2-5% are the large ones that Hessburg says “damages” the forest. Two things wrong with this assertion. First, the vast majority of all fires go out whether we “suppress” them or not if the climate/weather is not conducive for fire spread. In a way, the weather/climate allows “us” to “control” the fires or at least gives us the arrogant idea that we are in control. But it’s misleading to suggest that “we” put out the majority of fires. The second thing wrong is that the 2-5% of fires we can’t control that “damage” our forests—we can’t’ control because the weather/climate does not allow us to control them. And when they do occur—they do not “damage” the forest, rather they are essential to healthy forest ecosystems. Dead trees are critical to many species of plant and wildlife. WHAT CAN WE DO? Hessburg talks about potential solutions. One solution is more prescribed burning. While I don’t have a major problem with this, I do believe it’s deceptive at best. This “solution” only works at the driest and lowest elevations in forests dominated by ponderosa pine and perhaps some dry Douglas fir, and must be done frequently to reduce regrowth stimulated by the burning. Most agencies do not have funds for maintenance. Another problem with prescribed burning is the seasonality of use is different from natural fires. Prescribed burning occurs in spring and fall while most natural fires in our region burn in the summer. The ecological effects are not the same. Also, Hessburg seems to advocate burning in grass/sagebrush. Our sagebrush ecosystems did not burn frequently, and are harmed by frequent fires. We see a slide of a prescribed burn in 2014 and a 2915 fire that stopped at the prescribed burn. This is somewhat deceptive because we don’t know the weather/climate conditions under which the fire was burning. While there is no doubt that prescribed burning can slow or stop a fire under low/moderate fire weather conditions, the image is somewhat deceptive because the fires society is concerned about are the large fires burning under high winds, low humidity, drought, and high temperatures. Under such conditions, a prescribed burn as in the photo would not make any difference. We are told that the way to “restore” our “unhealthy” forests is to log them. This ignores the fact that a healthy forest ecosystem is one that is dominated by natural factors like wildfire or bark beetles. If the forests are “too dense” than beetles and fires can correct this more effectively and at less cost than logging. Keep in mind that logging “impoverishes” the forest ecosystem. It removes carbon. It spread weeds. Logging roads add sediment into streams. It changes age structure. It removes “structure” like snags, down wood from the forest. It increases access through logging roads, which are also a major source of sedimentation in streams. There is no acknowledgement by Hessburg of the multiple problems with logging. Perhaps the worse aspect is numerous new studies show that logging is both ineffective and inefficient at protecting communities. And in many cases, active forest management leads to higher fire severity (see references). The Vagen Brothers logging operation we see in the video “sanitizes” the forest. Keep in mind that many wildlife and plant species depend on dead wood. The logging operation has created what is essentially a tree plantation with widely spaced trees. There is little down wood visible. Few snags. This is not a healthy forest. It’s like a manicured lawn. Luke Vagen says we need “science” in managing our forests, ironically, he ignores the fact that science suggests we need a lot of dead trees in our forests. Events like wildfire, bark beetles are episodic and add to our “storehouse” of dead wood. Logging removes current dead wood, and reduces the future input of dead wood. Hessburg argues we need managed wildfire—in other words allow some fires to burn without suppression. He uses the example of the Buck Creek fire in the Washington Cascades as an example of managed wildfire where the naturally initiated fire was permitted to burn without full suppression. Hessburg argues we need a lot more managed fire and that is definitely a good idea. REDUCE BUILDING IN WILDLANDS INTERFACE AND REDUCE FLAMMABILITY BY EXISTING HOMES. Video of property owners Mike and Sarah Rolfs who thinned their 80-acre parcel and most importantly modified their home to make it less flammable. This emphasizes that much of the responsibility for reducing the costs of firefighting lies with private landowners. influenced primarily by patterns of drought and warming (2, 3, 20). Excellent commentary. As usual, nuance is glossed over by sound bites and simplifications that George correctly calls out in this piece. Good article, George. Of course, your point that fires are driven by climate, not fuel, takes the wind out of rancher claims that grazing reduces fires by reducing fuel. Fuel is the issue: heat without fuel leads to nothing; (a warming climate cycle)the extra bit of heat makes the prodigious fuel (grasses and brush; aka ‘kindling’) more susceptible to ignition (just simple chemistry of oxidation). It’s just obtuse to claim otherwise. The fact that the climate IS warming means we have to adopt and employ every strategy to minimize excess fuels in and around forests, which livestock should not be grazing in proximity to cervids, many of which may be sick or carrying Chronic Wasting Disease (CWD), a prion disease which manifests in cattle as Mad-Cow disease. I think the most significant factor is the weather. Few wildfires expand rapidly and become major unless the fuels have been dried, the temperature is hot, and there is wind. I would say all the great fires had wind fanning them with extra oxygen. Now, of course, there has to be ignition. In the Western United States, setting aside human caused ignitions, this usually means lightning. Climate change is the result of many days, months, and years of the daily weather being different than previously. Climate change means the months when it is hot enough to dry the fuels expands. Here in Idaho that was August-mid-September. Now it is July through early October. Newest science and evolution on the ground requires a lot of catching-up to do on the latest developments in cervid depletion in the evolution of abnormal fire regimes.